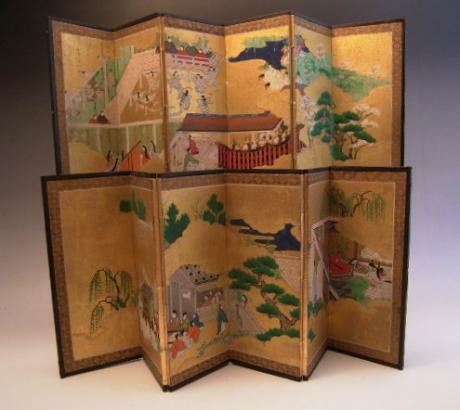 Japanese early 19th century large 6 fold screen. Beautiful painting of a fishing village, with a pine tree forest, fishing boats, fishing nets drying by the bayside and Mt. Fuji in the background. The clouds and fog are done in gold leaf. Unsigned. The screen measures 150" wide by 66" tall. 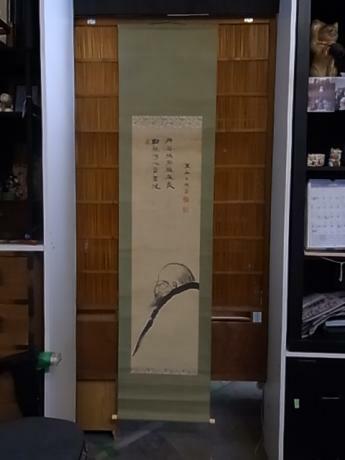 (..
Japanese late 19th to early 20th century scroll of DARUMA by TAKEDA MOKURAI (1854 - 1930). TAKEDA MOKURAI was born in Nagasaki, Japan. He eventually was appointed to the head of KENNIJI Temple in 1892 in Kyoto. KENNIJI temple was founded in 1202 and is the oldest Zen temple in Kyoto. 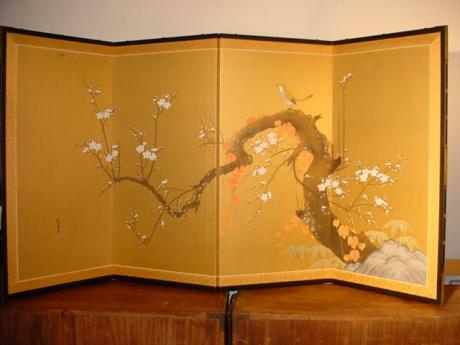 It is als..
Japanese early 20th century pair of miniature handpainted 6-fold screens. Delicately and beautifully painted. The frames are also done very nicely with a silk backing. Each screen measures 8" tall and 13" wide. 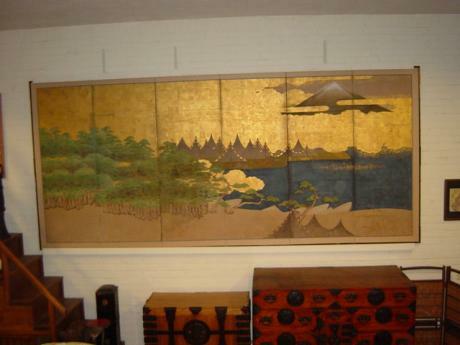 Japanese mid 20th century 4 panel screen. A beautiful painting is of a nightingale on a plum branch. The tree is full of blossoms. Signed by artist. The screen measures 36 1/4" tall by 70 1/2" wide.